Yesterday morning on Flickr Explore I saw some photos of California Poppies covering hillsides about an hour from here, east of us near Lake Elsinore. So Don, Benni and I got in the truck and took off to go find the wildflowers and when we were miles away we could see these hills which all looked copper colored with patches of green. Mainly poppies, blankets of them for miles. 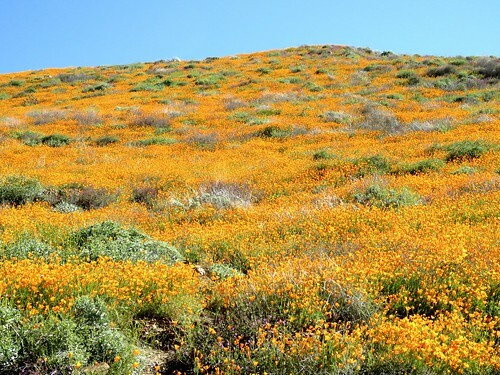 There were 8 other kinds of wildflowers to be seen but the poppies took over most of the land. We weren't the only people, we estimated hundreds had come to see but because this is a nature reserve no one could tramp around all over them and this was carefully monitored by trucks with loudspeakers. A really memorable thing to see.